bbum's weblog-o-mat » Blog Archive » What is good tequila? This weblog post is at least a decade in the making. Seriously. I wrote the original version of this sometime in the late ’90s as a mailing list post, then revised it again when someone at Apple asked for tequila recommendations. Likely forwarded it a dozen times or so in the interim years. Every time I forward it, I said “I should weblog this thing”. So, here it is — with some additional edits, too. Like my “So you wanna buy a big green egg” post, I’ll likely edit this over the coming years, too. I’m going to break this into two separate posts; one about tequila and one about margaritas. Eventually, I’ll make a third post about cooking, agave, and tequila. First, Cuervo Gold is not good tequila. It is actually a really terrible product, quality wise, backed by some brilliant market. Sadly, most of the tequila consumed in the United States is Cuervo Gold or something equally as bad. And by “bad”, I mean bad taste and vicious hangover. Good tequila is almost always a tequila that is made from alcohol distilled from 100% blue agave. Specifically, the species Agave Weber Tequilana. This plant of the class Liliopsida (Lilies) has nothing to do with cactus. Blue agave is grown primarily in the Mexican state of Jalisco. More specifically, Cuervo gold is a Tequila Mixto, Joven Abocado or, more precisely, young and adulterated tequila. By Mexican law, adulterated tequilas are at least 51% blue agave. The other 49% is generally comprised of the absolute cheapest, nastiest, sugar cane based liquor. If you are familiar with big city corner bodegas, the cheap rum in the plastic bottle on the bottom shelf behind the counter. “Bum rum” we called it in NYC. Adulterated tequila would not have any color. To give it color and take a bit of edge off, Cuervo (and others) add caramel. This ultra-nasty combination of cheap cane sugar alcohol and low quality agave distillate is the reason for the vicious hangover. Those massive nasty sugar molecules (Nonsense — massive nasty adultrants, as Sean points out in comments) break down into all sorts of evils that take your body a long time to metabolize. Hence, a Cuervo/adulterated tequila hangover is a trip through hell. If all you have had is Cuervo (or Mezcal with a worm in it), then you really ought to give a true 100% blue agave tequila a chance… it is a night and day kind of experience. Not all adulterated tequilas are bad. There are some excellent adulterated tequilas available, but they are very hard to find. Visit Tommy’s and Julio has ’em all. Of the 100% blue agave tequilas, there are 3 4 kinds; blanco, reposado, anejo, and extra anejo. Extra anejo was created in 2006 as a new market segment identifier. It is important to note that, in all segments, there are examples of tequilas that are excellent for sipping straight and others that are really only appropriate in a mix. A relatively unaged tequila. That is, the tequila is made from alcohol fermented from sugars found in the blue agave plant and then distilled. This is generally filtered such that it is bottled as a clear liquid, typically once fermentation is finished. Some blancos will be rested for upwards of 45 days, typically in large stainless steel tanks. 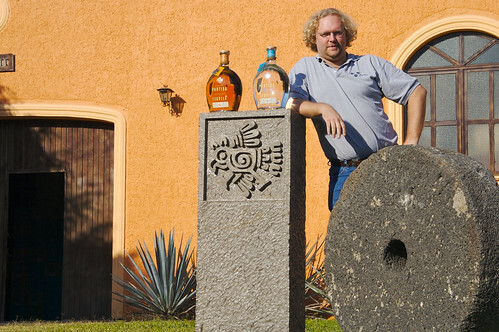 Some distilleries will oxygenate the tequila during this period of time, taking a bit of the edge off of the flavors. Blanco or silver tequilas are generally fruitier and will have a bit of a bite to them. Personally, a good blanco margarita is my favorite kind. El Tesoro, Herradura, and Fortaleza all make stellar blanco tequilas. Note that El Tesoro Platinum (blanco) has just a tiny bit of color. Unlike most tequilas, it is actually distilled to proof — that is, distilled to the bottling strength and not diluted down to bottle strength with water. It has less filtration and, thus, just a bit of color usually. El Tesoro Platinum provides one of the most herbaceous of the silver tequilas, offering the distinct flavors of the highland agave from which it is made. The Partida bottle on the right in the first picture in this post is Partida’s excellent blanco, the absolutely clarity of which is obvious in that picture. 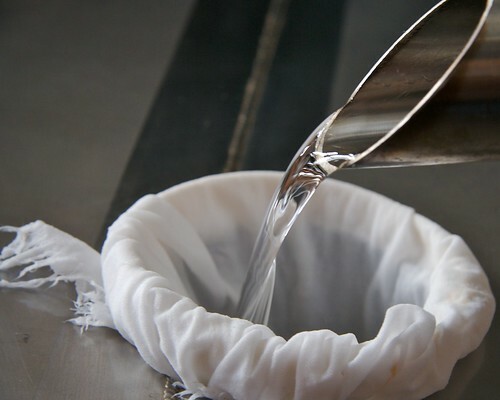 The tequila pouring out of the spout and through the bit of cheese cloth is about 70% alcohol agave distillate that, with water added to bring it down to 40% ABV, would be Centinela blanco. This is a slightly aged or “rested” tequila. The tequila in this segment is aged for more than 2 months but less than a year in oak barrels of any size; often hundreds of gallons. The aging process takes a bit of the bite and fruitiness off of the tequila, replacing it with a touch of the wood within which the liquid is stored. Many common and relatively cheap, decent quality, brands are often reposados. Some examples include Hornitos (a Sauza brand), Cazadores, and Cabrito. Of the three, Cabrito — Centinela’s discounted label — is, by far, the best. Of these, I would only use them in margaritas. I prefer reposados because they carry forth both the distinct flavors of the agave used in production and the style of distillation and aging implied by the distillery. My two favorite general purpose sipping (i.e. awesome quality casual sipping or mixing tequilas) tequilas are both reposados. From the town of Tequila in the heartlands of Jalisco comes Fortaleza, made by Guillermo Erickson Sauza (fifth generation in the Sauza family). El Tesoro Reposado is made in the highlands town of Arandas by the Camarena family. In the united states, once you move beyond the mixtos, the most commonly sold tequilas are either silvers or anejos. Not so in Mexico. The most commonly sold tequilas in Jalisco are reposados. When a family — an extended family in US terms — gathers for a meal, you’ll typically see a bottle of reposado or two on the table. Some drink it straight, some mixed with grapefruit juice and/or fresca. This isn’t surprising. Reposados offer a bit more smoothness — more sippable oakiness — than blancos, while still preserving the characteristic vegetal flavors from the agave. And they are considerably cheaper than anejos. Nothing beats a lazy sunday afternoon meal of tortillas, carnitas, various veggies and salsas, accompanied by a great reposado and a handful of different refreshing fruit juices and sodas to mix it with! To be in this class, a tequila must be aged in small oak barrels. Typically, in 55 gallon bourbon, whiskey or cognac barrels (though occasionally aged in anything from port to new oak barrels). Due to the aging in small batches in previously used liquor barrels, an Anejo tequila will take on the flavor of whatever was aged in the barrel. Aging can last anywhere from 1 to 3 years, after which it becomes an extra anejo. Some tequilas are aged in multiple kinds of barrels and then blended afterwords, possibly with more aging and often falling, again, in the category of extra anejo. During aging in these smaller barrels, upwards of 20% of the liquid in the barrel is lost per year due to evaporation. This loss is called the angel’s share and, given the volume lost, there must be some awesome angel parties in Mexico. The loss can be reduced by humidifying the aging warehouse / cave, but doing so both changes the nature of the resulting product and runs the risk of molds or other evil bugs taking up residence in the barrel wood, potentially ruining whole barrels. Flavors for well made Anejos move more towards scotches, whiskeys, bourbons, and the like. That is, you’ll taste more of the wood, it will typically be smoother, and there will be less of a vegetal flavor. This category was created in 2006 to provide an at-a-glance means of identifying the relatively rare tequilas that are aged for more than 3 years. Obviously, the angel’s share for a 3+ year old tequila is significantly larger and, thus, most of the tequila’s in this class are considerably more expensive. This is also the category where you will find tequilas that have been aged in multiple barrel types, blended and then aged more. Flavors in this category tend to be more unique and more intense, with some extra anejos approaching 20+ year old scotch in intensity and smoothness. Interestingly, tequila really doesn’t change much when it is left in the barrel for more than 7 years. Because the evaporation rate is high, the claim is that the aging process is accelerated. That does seem to be the case in that tequila picks up the flavors of the wood and gains an aged smoothness much more rapidly than scotches. Certainly, after 7 years in the barrel with 10% or 15% of the remaining volume lost per year, the concentration of the flavors in the remaining liquid will increase rapidly! There exists awesome tequilas in all of the above market segments and any good tequila will make a good margarita, too. A good margarita should carry through the flavors of the tequila used, though some of the subtleties of an anejo or extra anejo will be lost. I have been harsh on Cuervo. Cuervo does make some great tequilas. Their “Reserva De L’Familia” line is 100% blue agave and it is quite delicious. However, it is relatively expensive and I find the flavors to be overwhelming. For considerably less money, it is easy to find much better quality products. This entry was posted on Thursday, June 19th, 2008 at 1:37 am	and is filed under Entertainment, Tequila. You can follow any responses to this entry through the RSS 2.0 feed. You can leave a response, or trackback from your own site. Sure; I usually look for whatever happens to be on special that is decent. At the moment, I’m finding Corralejo Repo for $24, Gran Centenario Anejo for $35, and had been grabbing 950ml packs of Pueblo Viejo for $22. Of the three, the Gran Centenario is the only one good to sip. They all make great margaritas. Generally, I can find Herradura for pretty decent prices, too. For sipping tequilas, I’ll go for El Tesoro, Arette, Partida, old Centinela 3 year (newer stuff isn’t very good by comparison), Espolon, Tapatio, and, if I’m really feeling the treat, La Fortaleza (more expensive but, oh so amazingly fine). Those typically range from about $32 to about $80, depending on whether I grab a blanco, reposado, anejo, or extra anejo. I typically go for reposados for sipping as I like the balance between the vegetal nature of a young tequila combined with just a touch of wood from aging. I need to make another run to the local shops to see what is what. Yes. Don’t shoot it. Good tequila should be sipped; shooting it is just a waste. If you want to drink it in volume, couple it with a fruit juice or with Fresca (common in Mexico) and drink it as a cocktail. For that, any decent 100% blue agave will do. Herradura Reposado is a good start. Anyway, the only really sad thing about this is that I’m living in Canada, in the province of QuÃ©bec and it’s really hard, nigh impossible, to find good tequila. I think its a shame that good tequila is so hard to come by in the Great White North. The first step to making liquor is to make beer. You then “nearly” boil that beer to make some of the chemicals in the beer evaporate, which is then recondensed to make hard liquor. Depending on many conditions and variables, different chemicals are released in said process. Some of those chemicals are very poisonous and some give you a wicked hangover. Believe it or not, the alcohol is the least of your concerns when it comes to cheap liquor. These guys allow “nasty” stuff to reside in their product, while other producers work hard to keep those chemicals out of the bottle. In fact, many of those high quality distillers use what is in other products to clean their floors! The quantity of agave matters only slightly, its the quality of distallation process. Long sugar molecules…LOL!